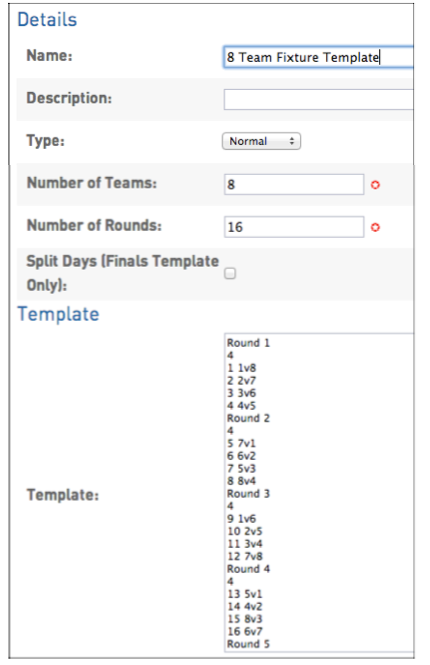 Fixture templates are used to determine the number of teams and number of rounds to be played within a competition. A set of default fixture templates will be available in your database, however of you'd like to keep the templates you've previously used in FIBA Organizer you are able to copy the 'formula' (i.e the 1v2, 3v4 etc.). 1. Click on the Settings icon and click on Settings. 2. Click on Fixture Templates and click on the Add button. 3. Add in the formula and details for the template (as below for example) and click Update Fixture Template to save. Tip: if you have fixture templates in your FIBA Organizer database that you would like to use Online, simply copy the formula (1v2, 3v4 etc.) and paste it in to the add template screen as above.